Stainless steel grades is the way in which we categorize the mechanical properties and production specifications as well as the composition of stainless steel. They commonly have a three digit number system which is used for the classification of grades. Austenitic stainless steels are the most widely used stainless steels for vacuum applications. They are non-magnetic stainless steels that have high levels of chromium and nickel and low levels of carbon, they also have an excellent resistance to corrosion and when annealed they become non-magnetic. Austenitic stainless steels have a relatively low resistance to electricity. Stainless steels used in vacuum systems. The main consideration in choosing materials for use in vacuum systems is that they do not impede the desired degree of vacuum pressure in the vacuum system. Stainless steel grades most commonly used for vacuum applications are austenitic stainless steels such as 304, 304L, 304LN 316, 316L and 316LN. Low outgassing rates to maintain good vacuum pressures (A specific risk of this is outgassing of the solvents absorbed due to cleaning of the material after manufacture. Another problem is the diffusion of gases through the material itself, the gases desorbed from the material can lower the vacuum quality and can be reabsorbed onto other surfaces) Another problem is the diffusion of gases through the material, with atmospheric pressure on the outside and vacuum on the inside, helium can diffuse through the stainless steel walls of the vacuum vessel. 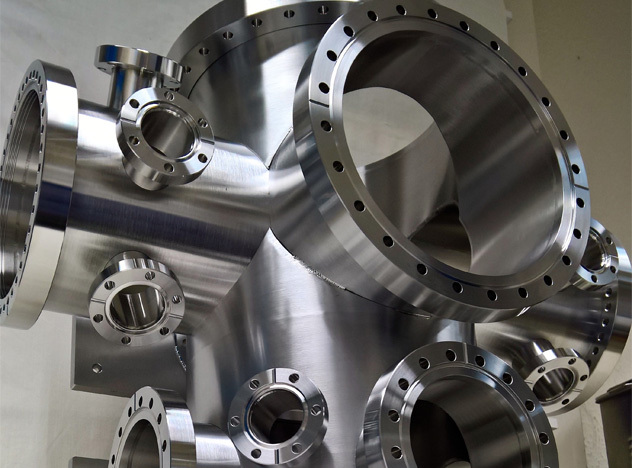 For UHV (ultra high vacuum) applications titanium can be deposited onto the internal walls of the vacuum vessel that traps the diffused gases onto the walls. Stainless steel grade 316L is also commonly used as it contains a higher nickel content than 304L and contains 2% to 2.5% molybdenum, this is to help the resistance to corrosion by chlorides. 304LN was originally developed as a higher strength version of 304L and is the quintessential non-magnetic grade especially in applications where low levels of magnetic permeability is required, this derives from its high nitrogen content. Applications include – MRI scanners, pressure vessels and cryogenics. It is also used for vacuum equipment for research and production applications such as the process of imaging tubes and photon detectors.